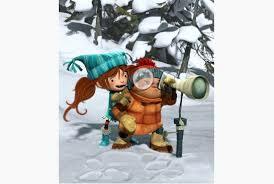 One snowy winter, a group of children split into teams to play war. One team has built a marvelous fort of snow, and the other is committed to recapturing it. Their generally good-hearted and innocent play brings together nerds and cool kids, boys and girls, and helps new kids make friends. However, the warlike nature of the game distresses Nicky, a pacifist, and also brushes up against the loss that Luke remembers; his father died at war fairly recently. Will the kids’ friendships survive when the game leads to an accidental, but very real, loss? Luke lost his father (in a war), and continues to remember him and process his loss. Sophie and her sister are new kids in town. Themes of parental loss and being the new kid in town might be familiar to kids who have been adopted, and especially those who remember spending time in foster care. 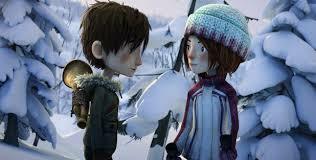 The children in Snowtime have real emotions, but are genuinely good-natured and forgiving. They play fair with each other. This is a charming and, with the exception of the spoiler below, happy movie. The spoiler changes the tone of the film from lighthearted to heavy, but the kids still retain their basic goodness. Luke still struggles with feelings of loss after his dad’s wartime death, but he continues to live, interact with other kids, and play. He is able to tap into his feelings to comfort another child who has suffered a recent loss. One loss is shown on screen which could be traumatic to young viewers, and Luke is blamed for a death. 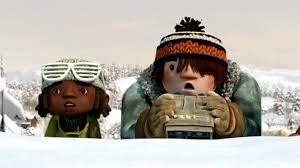 I wondered if some military families might struggle with the film; it captures the loss, boring moments, and fun that the kids experience in their play war while also highlighting the loss that lingers for one of the kids after a real war. This is a unique film, and it’s absolutely worth parental attention. It could be very powerful for some kids, but triggering for others. 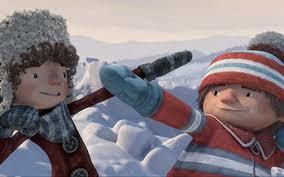 Snowtime is a charming film which captures the innocence of childhood in a way that is at least somewhat reminiscent of Peanuts. It becomes more serious, however; imagine if Peanuts dealt with death and profound loss. Overall, I like this film. I’m writing this review the day after watching the film, and I’m still thinking about the film. I feel like it’s one that might stay with me for a while. 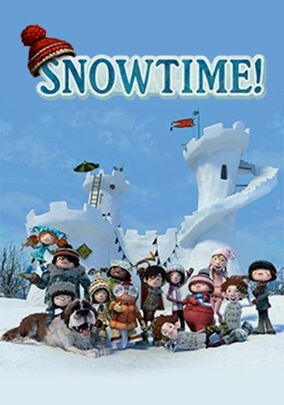 There was a profound loss in the film that will make the film too sad for the youngest viewers, but for kids ages 9-12 or so, Snowtime could be a good choice. Parents might want to screen it first; the film is good but heavy. It captures the fun of childhood, the pain that some kids experience due to loss, the interplay between the two, and the ways in which both can lead to connection. It could be triggering for kids who have lost a parent or a pet to death, but it could be a helpful tool to connect with and process the emotions that accompany the loss, and parents might need to see it first to decide whether it’s a good fit, but it is absolutely worth screening since it has the potential to be very powerful. (SPOILER ALERT: Cleo, the beloved dog of one of the children, is crushed to death by the falling snow fort. END SPOILER). Will Luke and Piers remain friends? How did Luke’s experience of losing his dad help him connect with Piers when Piers was sad? Do you think Luke is mostly happy, mostly sad, or both? Which kids would you be friends with? If you could design a snow fort, what would it look like?